SIZZLING (AUS) (Bay 2009-Stud 2014). 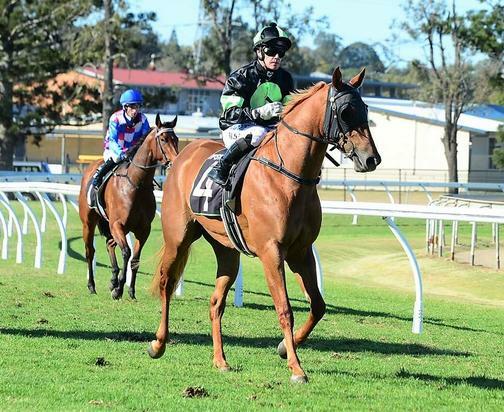 7 wins-5 at 2-from 1000m to 1600m, A$1,332,375, BRC TJ Smith S., Gr.1, Champagne Classic, Gr.2, Sires' Produce S., Gr.2, Queensland Guineas, Gr.2, Gold Edition P., L, GCTC Ken Russell Memorial Classic, L. Out of SP Admirelle. Grandson of SW Laudemio. Sire of SP Secret Blaze, Sizzling Belle, Sizzleme and of Zizzis, Saint Antonio Lad, Sugar Sizzle and of the placegetters Bondi Boy, Burbank, Endless Sizzle, Hot Gambler, Line Up Girls, Scorch, Sizzleonthebridge, Sizzling Ace, Swelt, etc. His oldest progeny are 2YOs. GLENDARA (g. by Show a Heart). 7 wins from 1200m to 1650m, A$313,000, to 2017-18, Qld Tatt's RC Members' Cup, L, BRC Harcourts Northlakes H., Sundays at the Boundary P., Ipswich TC Ray White P., Higgins Coatings H., 2d Gold Coast S., BRC Treasury Hotel Wedding H., Superiorpak H., K Tanchevski Mush 2 Mush H., Origin Jockey Series Heat 3 H., Ipswich TC Harvey Towing H., Toowoomba TC Wimmers Soft Drinks H., 3d BRC Novotel Airport P., Cascade H.-twice, AAMI Stradbroke Raceday P., SCTC Racezone National Apprentice Series P., 4th Qld Tatt's RC Tattersall's Mile H., L.
Iron Craft (g. by Rothesay). 2 wins at 1300m, 1350m in 2016-17, BRC Weddings at BRC P.
Jonovich. 4 wins from 1600m to 2200m, R250,800, Greyville Racing It's a Rush H., Turffontein Bet Soccer 6 H., Racing Association H., 3d Greyville Racing. It's a Rush H., Interbet.co.za H.
Spellbound. 2 wins at 1200m, 1600m, R165,925, 3d Turffontein All to Come Juvenile P., Vaal Racing It's a Rush H., Thank You for Joining Us Today H.
Thornbird. 3 wins at 1000m, 1200m, R161,925, to 2016-17 in South Africa. Dane Keeper. 5 wins from 1250m to 1600m, A$169,776, MVRC Adapt Australia H., VRC Williamstown H., MRC Betfair H., STC Millennium Foundation Clubs Day Out H., 2d MVRC Rosier Commercial Furniture H., AJC Birthday H., MRC Braywin LMF H., High Caste H., STC Haden H., 4th MRC John Dillon S., L.
RIZON (Zabeel). 4 wins from 1600m to 2400m, NZ$24,450, A$327,450, MRC Herbert Power S., Gr.2, VRC Riverdale H., WRC Q5M H., 2d Moonee Valley Gold Cup, Gr.2, Matamata RC Rich Hill Stud H., MRC Beau Gem H., 3d ARC Lindauer Special Reserve H.
SIR CLIVE (Bigstone). Champion 3YO in NZ in 2000-01 (Stayer). Top of The 2000-2001 NZ 3YO Free H. (1650m+). 7 wins-3 at 2-to 1500m, NZ$161,575, A$495,600, AJC Hobartville S., Gr.2, Ashburton RC Ray Coupland S., L, 2d New Zealand Derby, Gr.1, New Zealand Two Thousand Guineas, Gr.1, Australian Derby, Gr.1, 3d Levin RC Bayer Classic, Gr.1, Avondale Guineas, Gr.2, MVRC John F Feehan S., Gr.2. SARACINO (Per Incanto). 3 wins at 1200m, 1400m, NZ$184,375, A$174,175, in 2016-17, Wellington Guineas, Gr.2, VRC Danehill S., Gr.2, Waikato RC Foxbridge P., Gr.2, 2d Taranaki 2YO Classic, Gr.3, 3d Manawatu Sires' Produce S., Gr.1, Waikato Sprint, Gr.1.